Transportation Costs > How Much Do Personalized License Plates Cost? How Much Do Personalized License Plates Cost? Personalized license plates, also known as a vanity or custom plate, allow the registered vehicle owner to choose the license plate letters or numbers as long as they are not taken by someone else. While most states have restrictions such as no offensive words, there is also an additional fee that is going to apply when you want to register a vanity plate within your state. The cost of a vanity plate is going to vary depending on your state. The chart below is an average of what you are going to pay for your plate according to your state. 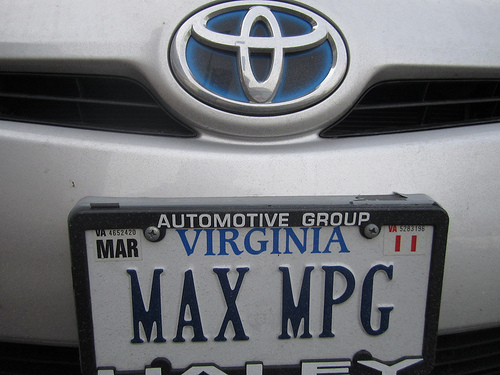 How much does a personalized vanity plate cost? The cost of a vanity plate is going to be an additional fee on top of the already existing registration fee. The fees listed below will not include the registration fees that are charged annually. A vanity plate is going to allow you to customize your plate any way you want it. As long as the plate name is approved and is not taken by anyone else, it will be approved. An example of a vanity plate could be something such as BLOGGER and can be formed using all letters, all numbers, or a combination of the two. Before this type of license plate is purchased, you will want to make sure that the name is available with your local state. Every state will have its own rules on what’s going to be allowed as well as how many characters and numbers you may have. When you do apply, the DMV office will be able to do an instant search on what’s available at the moment or you may be able to do it online, depending on where you live. In order to order a personalized license plate, each state is going to be different with their process. Each state may allow you to order online, order via the mail or even by fax. Be sure to reference your local DMV website to see how the process works in your state. Lawyers.com has a list of the official motor vehicle websites for each state. Most plates can take up to eight to 12 weeks to deliver. The fees listed above will be added to your registration fee. A vanity plate enables you to showcase your personality to the rest of the world. Since it is not necessary, however, ask yourself if it is truly worth the additional fees that the state will charge you annually.